One of the original thirteen colonies, Georgia is the 24th largest state in America. It's situated in the southeastern region of the country, with borders to Tennessee, North Carolina, South Carolina, Alabama, and Florida, with a portion of the state of Georgia also on the Atlantic Coast. In terms of physical size, Georgia covers an area of 59,425 square miles. Nicknamed the 'Peach State', Georgia was originally named after King George II of Great Britain. The state has a rich history, being one of the original Confederate states and playing a major role in the American Revolution and Civil War. The capital city of Georgia is Atlanta, which is also the largest city in the state. The Atlanta-Sandy Springs-Roswell Metropolitan Statistical Area is the biggest metro area in the state of Georgia. Here are some key details and overviews on the largest cities of Georgia. Situated mostly in Fulton County but also stretching into DeKalb County in the northwestern part of the state, Atlanta is the capital city of the state of Georgia. Atlanta is also Georgia's biggest city, covering an area of 134 square miles and having an estimated population of 486,000 people, with over 5.7 million in the surrounding metropolitan area. This city was founded in the 1830s and originally called 'Terminus' due to its situation on the Western and Atlantic Railroad. The name of the city was changed to Marthasville in 1843 and then Atlanta in 1847. The city of Atlanta is the 38th most populous in the United States and is the major commercial and cultural hub of Georgia. 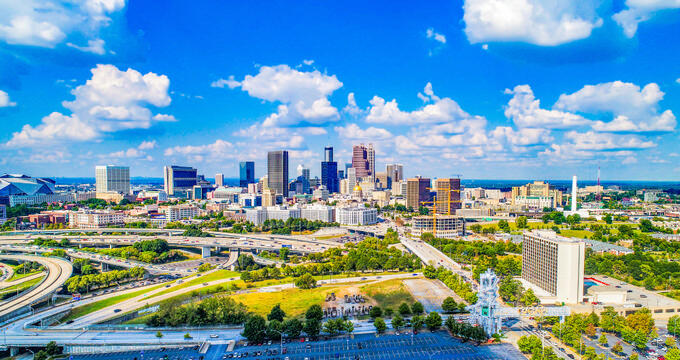 It is well-known for having lots of green spaces, earning the nickname 'City in a Forest', as well as being home to the busiest airport in the world: Hartsfield-Jackson Atlanta International Airport. Located on the Savannah River in the Piedmont part of Georgia, Augusta is the second biggest city in the state. It can be found on the eastern border with South Carolina and covers a very large area of 306.5 square miles due to its status as a consolidated city-county. Augusta has an estimated population of 197,000 people, with over 600,000 in the surrounding metropolitan area. The city was founded in 1736 and named after Princess Augusta, the Princess of Wales. Augusta is best-known for hosting one of the four major PGA golf tournaments: The Masters. The city also notably enjoys a warm climate, helping to set it apart as one of the key resort towns in Georgia. Located on the Chattahoochee River on the western border of Georgia, not far from the Alabama city of Phenix City, Columbus is Georgia's third largest city. It's the county seat of Muscogee County and, like Augusta, forms a consolidated city-county. Columbus was named after the world-famous explorer of the same name and was founded in 1828. This city covers an area of 220.8 square miles and has an estimated population of 194,000 people. Columbus is known as a key transport hub for the state of Georgia, having close ties with Alabama and being just 100 miles away from Atlanta. The city is also known as a key tourism site, with many museums and historical landmarks, along with the Chattahoochee River which is very popular for whitewater rafting and kayaking. Like Augusta and Columbus, Macon forms a consolidated city-county and is the fourth biggest city in the state of Georgia. It is known as the 'Heart of Georgia' due to its central location in the state, and is situated just over an hour away from the state capital of Atlanta. Macon covers an area of 255.13 square miles and has an estimated population of 152,000 people, with around 228,000 in the surrounding metropolitan area. The city of Macon is known as a strong educational zone, as well as being a popular tourism site for the state of Georgia due to its many museums and historical buildings. Situated in Chatham County, of which it is the county seat, Savannah is the fifth biggest city in the state of Georgia. It was founded in 1733 on the Savannah River and played a key role in major events like the American Revolutionary War and Civil War. Savannah is located in the eastern part of Georgia and covers an area of 108.7 square miles. It has an estimated population of 146,000 people, with 387,000 in the metropolitan area. Savannah historically had one of the most important ports in the country and is now a popular tourist location.